A seemingly standard Spring Training play turned troublesome when Boston baserunner Hanley Ramirez returned to third base after appearing to score a run against Toronto on JD Martinez's double to the wall at JetBlue Park (aka Fenway South). With replays indicating the ball appeared to bounce off the base of the wall before being scooped up by Blue Jays left fielder Teoscar Hernandez, as opposed to becoming stuck in the wall, what happened to send Hanley back to third? The Play: With none out and Hanley Ramirez at first base (R1), Martinez hit a line drive down the left-field line, bounding to and off the wall for a double, where it was fielded by Hernandez as Ramirez touched home plate. After the play, Ramirez returned to third base. According to BoSox official scorer Justin Long's report, Martinez was credited with a ground-rule double to left. The Rule: To clarify, there are no stadium-specific ground rules that would cause a ball to become dead if it caroms off an in-play wall and bounces or rolls back onto the playing field, so the "ground rule double" label is a misnomer. Instead, consider Official Baseball Rule 5.06(b)(4)(F): "Each runner including the batter-runner may, without liability to be put out [the ball is dead], advance—Two bases, if a fair ball bounces or is deflected into the stands outside the first or third base foul lines; or if it goes through or under a field fence, or through or under a scoreboard, or through or under shrubbery or vines on the fence; or if it sticks in such fence, scoreboard, shrubbery or vines." For more on this rule, see: Cause You're Stuck in the Wall - Batted Ball Out of Play (9/20/16). Is this uncatchable line drive trouble or not? 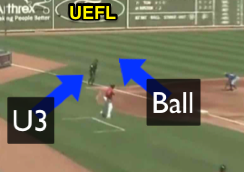 Analysis: Replays indicate the ball did not fall out of play nor stick in the fence, but if any rule were to justify bringing R1 back to third base, it would be 5.06(b)(4)(F). The bigger officiating question, naturally—and assuming that Ramirez didn't return to third base on his own volition—is why 3B Umpire Tim Timmons did not go out with the ball if it could potentially cause trouble by virtue of the stuck vs. loose debate. Does that qualify as "trouble" or is this non-catchable line drive a run-of-the-mill batted ball that merits no special attention; when should a field umpire go out? 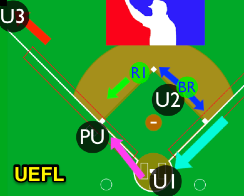 Officiating Mechanics for the Four-Umpire System: With a runner on first base only and the second base umpire positioned inside, the first and third base umpires share responsibility for the entire outfield area. For a ball hit to left field, the third base umpire assumes primary responsibility. When the third base umpire goes out, the home plate umpire rotates to third base and the first base umpire goes home upon observing baserunner R1 commit to third. The second base umpire then assumes responsibility for R1 back into second, and for the batter-runner into second or back into first. The idea is that just about every permutation and base is covered, even with only three umpires in the infield. See the following video for a visual depiction of this. Diagram of umpire rotation when U3 goes out. 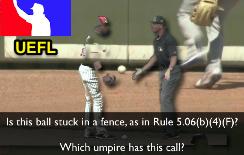 According to MLBUM, "one umpire will go out on ALL fly balls and line drives to the outfield, as well as on all batted balls that have potential for trouble (out-of-play areas, spectator interference, etc.). Outfield coverage is not required on line drives in the gap that are immediately read as non-catchable and are not susceptible to trouble such as spectator interference or a ground-rule double." For this play, Martinez's batted ball to left clearly was non-catchable, but was potentially susceptible to trouble, due to stadium boundary issue caused by the gap between the dirt warning track and base of padding along the left-field wall, and possibility that the baseball could become stuck in that area. Colloquially, however, most umpires would read this as a non-trouble ball—especially in a two-person crew—and stay in the infield so as to ensure maximum coverage on the bases (or, a higher likelihood of a play being made on a runner at a base than whether a ball is or is not stuck in the outfield fence). Unfortunately, in this situation, and barring a supposition that Hanley returned to third on his own, staying in may have made the ball more troublesome than it actually was. To stick is "to remain persistently or permanently," or "to become fastened, hindered, checked, or stationary by some obstruction." The only question to answer here, then, is whether the ball's motion or position completely stopped upon bouncing or rolling into the wall. Because it appears the ball bounced back onto the warning track after touching the wall, I would surmise the ball did not get stuck and play should be kept alive.